Discussion in 'Plug-in Vaporizers' started by Ed's TnT, Jul 28, 2016.
hi everyone. just got the vvps, think thats the right initials. had a question. the lowest i can get the vvps to go is 9.30. wanted to see if thats normal, cause i saw others posts with voltage of 6 or so. I have the same one you do. Yes if you turn it to the lowest it is 9.25 or so. Like others have said the high 11s are a good range but you'll find that out on your own. Enjoy! ataxian, Ed's TnT, pxl_jockey and 4 others like this. The 9.25v might be good for the aromatherapy attachment. I like anywhere between 11 and 12.6v for flower and 13.2 to 13.5v (short periods only) for concentrates. ataxian, Madri-Gal, Ed's TnT and 5 others like this. The 9.25v might be good for the aromatherapy attachment. I never go over 4 volts when using the aromatherapy bowl and even at that setting it can get HOT. ataxian, Modicum, Ed's TnT and 2 others like this. yeah the power adjuster is to many volts for me. im using the dial to ight for the first time and works best for me. around 7 for 3 hits with good flavor and around 10 for 3 hits or so to finish off. i think over that the heat really takes away from the flaor for me and i feel. the same effect at 10 volts the. i did at 11.8.
i would love to find a digital that goes to 4 at least and have presets that would great. ataxian, Madri-Gal, Ed's TnT and 2 others like this. Yeah, I definitely had frankincense boil into my first woodscents when it got turned up too high. Lol. Hello and good morning everyone, I know its been some time since I was in here and have been in and out of other areas being as I wanted to take some time here. I have just scored some American Bog Oak, I hadnt thought there was any and hadnt ever seen any but saw some and had to have it. What I have found is rated at 4-6000 years old and found in Indiana. I am even getting some Bog Elm or Locust, it has a lighter tone but still rated the same age range. I am guessing the grain is tighter and more dense not allowing for the deep darkening like the oak does with its more open grain structure. Just think about it, who do you know that has a vape made from a log that was around and growing 6,000 years ago??? I should have it in hand by first of next week and will begin working it in soon. Have also started working with Vgoodiez and have been sending them these beautiful 19/19 x 14mm RBT stems for various devices. Will say they are not just for 19/19mm females but how I have turned them fit and work great in any 18mm female joint also. 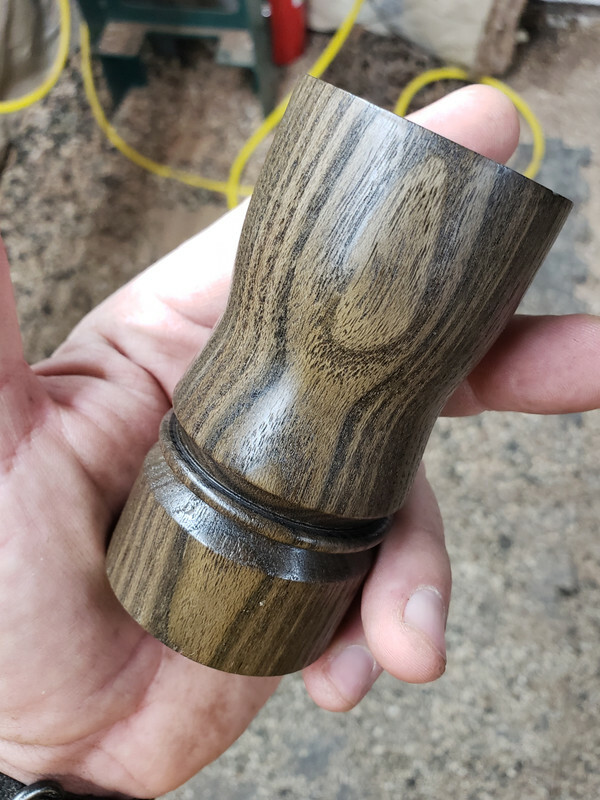 Will be offering through them a new WoodScents species never done before and only offered by them so keep an eye out for that and if you have an IG account and follow me there you can get an idea of whats to come. 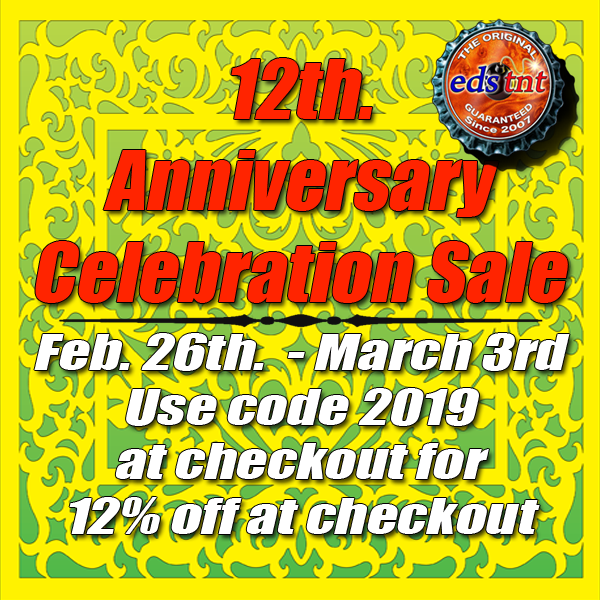 Will also give you all a heads up that its coming up on my 12th year in biz anniversary and we all know what that means right, will be doing a sitewide sale and no better time to grab a WS or any other piece you may need at 12% off. I am thinking end of the month first of next I will have this sale and will notify you all of the specifics before then with plenty of time to prepare and get in on the deals. Wow 12 years doing what I love and still going strong, big big thanks to all for the support and encouragement over the years and look forward to many more! The CE cert. is almost final you all, still working out the tiny end details but all is good and making way! Just at about a month out from Spannibis and cant wait to make that trip, what a great time it will be. Will surely let you all know how it went and what a time had. @blokenoname sorry for the delay and hope you were able to find what you were looking for. @ubardog I am sorry you were having trouble and hope its been worked out now for you, if not pls let me know more and will work to get you right. If you like you can get with me by email thats in my sig. I am not sure what you are asking that I changed in order to get the CE, I havent changed a thing in order to get it actually. I did change the lead shields long long ago. Yes any WS that ships to the EU or UK will have the CE rating soon even if order directly from me. I hope I have been helpful and if I can do anything else for you hit me at my email. @Alex3oe My man, its always a pleasure chatting with you. I appreciate your kindness and your post, its a trip when I hear "legend" maybe one day I will be when I am long gone and still have some pieces floating around but until then I will keep doing what I do and love, just being a guy that does for others what I want done for me and mine, hows that? I am really happy you are enjoying your WS and hope you do for an awful long time. I wish you well and all the best! @HughJundys Brother I am sorry for being late to your Tuesday frustration but glad I was able to help ease it some. I hope you got it all sorted out and has been well since and thanks for the posts. @KidFated. Bro as always I appreciate you stepping in with advice and wanna thank you also for the support you have shown for me bro, am most grateful. I was talking to our guy telling him how youve always been a solid to me for years, am always here for you however I can be bro. @LongDraw It was a pleasure working with you to sort you out on the end piece and sure fire stunner you decided to go with. You posted you were using the dial and at 10volts you got the same effect as at 11.8, the dial at 10 would be at the 12v max so you should be getting the same results. The dial itself doesnt indicate individual volts but ranges of voltage 10 being max. If I am confused by your post pls let me know. I wanna say the little small tattoo power supply will go that low but cant be certain as its been a while since I saw it or even used it. I would like to hear more aboiut your experience with it after getting to know it more and I hope all is well. @bizwaxzion & @triskelion I appreciate you both jumping in as well, thanks. @LesPlenty thanks for the post bro and the tips, I run mine on the dial for aromatherapy at 7 and for hitting at 9-10 or so. @-dab8- Uh oh, not cool. I gotta be out yall, gots work to be done and wish you all the best! Modicum, ataxian, Irish vaper and 15 others like this. What does anyone think of using Howard butcher block conditioner for care of their WS? @Eds_TnT better get a metal lathe for that locust if it’s anywhere near as hard as a seasoned black locust fence post. That should have some amazing grain and color! ataxian, Madri-Gal, Ed's TnT and 3 others like this. Can't wait to see what creative masterpiece you have in store for us! Vital, ataxian, Madri-Gal and 6 others like this. 12 years and going strong. Ed's TnT is literally blowing up ! "Cheers Ed"
ataxian, Madri-Gal, triskelion and 5 others like this. ataxian and Ed's TnT like this. Thanks for all the hard work @Ed's TnT ! ataxian, Ed's TnT, BigJr48 and 1 other person like this. Congratulations Ed! More Power Chief! arb, ataxian, LesPlenty and 2 others like this. Ed did an interview for the Vootra Blog. Interesting read, and some great pictures. 12 years and going strong...Congratulations Ed! ataxian, LesPlenty, BigJr48 and 5 others like this. Good evening everyone so here we have it, been another great year with 12 behind me and starting on my 13th in business. I cant say just how thankful I am that my family is happy and healthy, I got plenty of work to do and alot of goodness ahead. Im still doing what I do and still loving every minute of it. I working on adding a couple more dealers one in Italy and another in the UK, been getting work out as quickly as possible and gearing up for more. Not sure how many of you have IG accounts, Randall from Focus got my Aero pieces in yesterday and did a video last night to show how well they work. Was fun doing that piece and is the best when its in the hands of someone else and they are enjoying what I did. Thats a big big part of what I do and love that makes it all worth it. I am going to start my anniversary sale the 26th and run it through the 3rd. At checkout enter code 2019 for 12% off your order. I got that US BogOak in and did a couple pieces, I have worked it many times and only a few as far as WS go, I have never seen anything this unique in it. These are most certainly the rarest of all I have ever done in BogOak. I gotta believe the difference is the density of the grain, these are much tighter than anything I have gotten from Russia or the Ukraine. They are dense yes but the grain is not quite as tight so would absorb more of the nutrients. Remember these are rated to be 4-6000 years old. I only have 2 and 1 is gone so if anyone else would like to get it while the getting is good get at me. I have these in 10, 14, and 18mm as well and work with all my WS and DV Ti tips. I am not certain if they work with other DV tips but would guess they do since all DV stuff is compatible. I want to thank everyone again for all the support, encouragement and friendships I have made here and elsewhere since starting this journey. I hope I can do this for at least another 12 so keep an eye out for me. @slozukimc Hmm not sure about that butchers block conditioner, I have only used BAB and cant recommend anything else. Ohh get this it wasnt too tough cause more than half of the order was cracked and split. I spent alot of dough on it and thankfully the seller sent me a return label and gave me a refund. Was such a big let down but glad I got what I could from the 2 blanks. @BigJr48 I appreciate it my man and will keep doing what I do, thanks for always staying up! @Modicum Haha thanks so much brother, I appreciate all the work you have given me and wish you well. @Ramahs thank you for the support and all you do for me, am most grateful. @triskelion Heck yeah bro, I aint going anywhere so stay posted. @Vital Thanks for spreading the word, that was a fun interview to do and appreciate the kind words. I hope you are well bro and will be in touch. Modicum, Alex3oe, -dab8- and 9 others like this. You are very welcome Ed. Happy 12th Anniversary! The 4-6000 year old BogOak you crafted is absolutely gorgeous...I need a bib. RUDE BOY, LesPlenty, Razshiro and 4 others like this. Anyone have any experience with concentrates with the Dynacoil and one of these? LesPlenty, Ed's TnT, KidFated. and 1 other person like this. You wouldn't be able to insert your Woodscents heater tube into your Dynavap tip with the coil in there blocking it. LesPlenty, Ed's TnT, KidFated. and 2 others like this. That thing is stunning, but according to Ed's web-page he's sold out of BogOak. Congratulations to the proud owner (whoever they may be), and the artisan that created it...Ed. CLEAN UP ON AISLE 6!! My E-nano made me fall in love with log vape, however, being from the UK, I've always found it a big pain that I have to use a massive step down converter to use it on 220v. Been keeping an eye out for this CE version to be released in the UK, however with this ongoing sale I am tempted to just go for it now. Not too worried about having the CE seal or not, as long as I do not have to use a step down converter. Anyone here from Europe has one of these beauties and can confirm if you can purchase a regular UK adapter for this, or if it also requires a step down converter? LesPlenty, Ed's TnT, BigJr48 and 1 other person like this. LesPlenty and Vital like this. Picked up a Mexican Katalox... I've been waiting for this one specifically. Love the two tone look! Ed's TnT, Whisper and Ramahs like this. I just bought an inexpensive tattoo power supply (240 V ~ 0 to 18 volt) from DH Gate and it's great. If you are planning to buy a WS with one of Ed's variable power supplies then you might not need to get anything except a power cord with a UK plug, best to check with Ed himself. You can definitely avoid the need for a step-down though. LesPlenty, Ed's TnT, triskelion and 1 other person like this. That's perfect, thanks a lot for the suggestions everyone! Immediately placed my order, can't wait for it to arrive! LesPlenty, Ed's TnT, Ramahs and 3 others like this. How is the leather attached to the base?